Much better than the first movie, this one is gritty and dark in it’s first half, and then adventurous and twisty in it’s second half. This second film is a pretty good movie, filled with dark rage and gritty atmosphere. it’s clearly going the empire strikes back route, being much more bleak than the first film, and all the better because of it. The future is depressing just as it was in Farhenheit 451 or any other movie that was modeled after it. Here, things are worse than ever, and the president of all the districts, (donald sutherland), orders up an all-star hunger games so that none of the previous winner thinks he or she is immune. The whole thing is jus an excuse to get Katniss (Jennifer Lawrence) back in the arena, of course, but that’s okay, because this time the actual fight to the death competition is handled with much cooler ideas. The movie still doesn’t go for the brutality and combat that it needs, but there are plenty of other traps and obstacles and twists to make up for it. 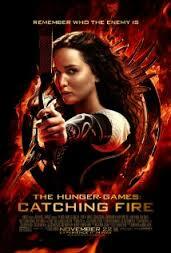 Katniss gets a visit by President snow (Donald Sutherland), and he has no problem threatening her and her loved ones. He shows her that he knows every one of her secrets including a kiss she shared just a few scenes earlier with gale, the other boy in her life. While there is a sort of love triangle going on here, I like that these movies never put the romance first, like the Twilight films did. Instead, whatever romance exists is very much in the distance, removed from this plot of a devastating future and corrupt government. Katniss goes on a victory tour with Peta, visiting each of the districts and telling the poor people she comes across how great the hunger games were. This is why snow came to threaten her. She needs to start acting like she is on the side of the capital, supporting the hunger games. Katniss does this, only the people don’t believe her and hold up a hand signal for rebellion. that’s when the guards go out and attack these people. the movie is very dark and gritty, especially in its first half, and it works out really well for the tone of the film, just like it did in other dark and gritty sequels like the empire strikes back. there are two things that really stand out in the first half. the first is how cold and uncomfortable this world is. credit that to director francis lawrence who took over the directing reigns from gary ross here. lawrence is the man behind i am legend, a very bleak and cool look at the zombie appocalypse. ross, on the other hand was the director of movies like big and pleasantville. he was like a zesty and optimistic gary marshal type, who thought everything could be seen through a friendly candy-colored lens. in lawrence’s hands, the movie plays out with the level of dirty and gritty atmosphere that it needed. there’s an early scene, for example, where gale is whipped publicly in the middle of a square by a guard. there was nothing in the first movie that even resembled this kind of torture. the second thing worth noting is that there are a lot of references to the first movie. that’s exactly what a good sequel should have. especially in its first half. we see images of some of the other kids who died and hear stories about them. we hear conversations about some berries that katniss did not eat in the last film and how her rejecting them was actually an act of defiance against the gamemakers. these references help connect the two films together nicely. and then it’s on to the story of this movie, where president snow has decided that katniss is too much of a sensation. not only is she causing trouble herself, but she is showing the other victors that they can be powerful and make a difference too. i’m not really sure i buy this angle. i knew when i heard there was a sequel to the first book, that in the second one, katniss would just have to go and play in the hunger games again. and i knew the movie would have to come up with a lame excuse to get her back into the ring. here, the excuse is that they do it in order to show all the previous winners that they are expendable. snow’s idea is to have an all-star game, where the only players going in are previous winners from past years of the hunger games. he tells everyone that every twenty-five years they hold this all star event and that this is the third time they are doing it. wouldn’t people know if this was true or not? if it wasn’t true, they would certainly know that he was making it up, and had never been done before. and if it was true, then wouldn’t people have been expecting the all-star game to happen this year, kind of like the olympics, every four years? there are many things that this movie does better than the first film, and one of these is that it actually introduces us to the different characters who will be with katniss and peta in the ring, and spends a little bit of time with them. i could have used even more of this than the movie offered, because once you get inside the arena, it’s just too hard to keep track of everyone. if you have some previous knowledge of who characters are going in, it certainly helps. once the games begin, we get a whole bunch of cool tricks and traps. there still isn’t enough combat between characters, but at least this movie doesn’t shy away from it the way the first film did with it’s blurry vision. instead of combat, however, the movie does offer up a whole bunch of obstacles. first there’s poisonous smoke that burns the skin like acid. then there are some monstrous baboons. when the characters finally make it onto the base where all the weapons are, the gammakers, who are watching from a control room spin the base around like an island that is moving at the speed of a top, and characters start falling off it. the end of the movie is a bit of a letdown in the way that there really is no ending and instead everything is left open, leading to another movie. i don’t like that at all. it reminds me of how the matrix sequel ended, with an imposter on board the ship. then again, the empire strikes back ended with han solo frozen in carbonite, and you knew that wasn’t the end of the whole story either. the hunger games: catching fire definitely loses some of its momentum in the second half, specifically when the characters come up with a plan not to take on each other, but to take on the system. even still, it is so much better than the first movie that anyone who has seen both films has to be pleased.